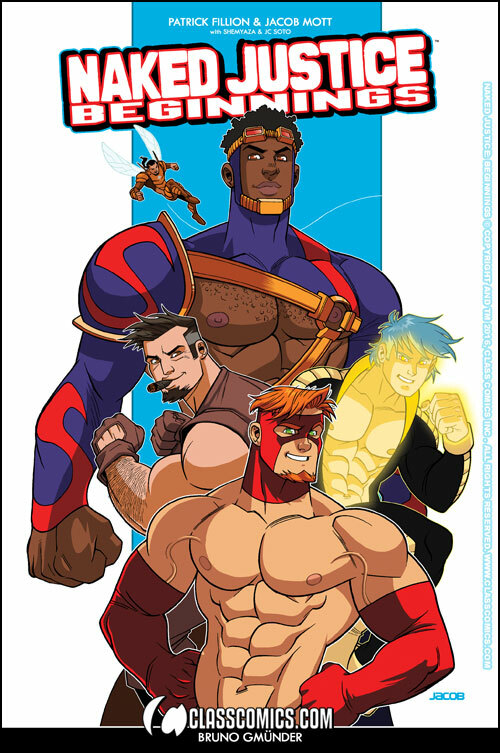 Class Comics has teamed up with fine gay art and photo books publisher, Bruno Gmünder to bring you a fantastic new Trade Paperback Graphic Novel Naked Justice: Beginnings The Collected Edition! This amazing book is a whopping 128 pages and it collects every single issue of the Naked Justice: Beginnings series. It also includes an all-new, never before published Naked Justice and Trip story, written by Fillion and beautifully illustrated by JC Soto. The tale entitled “Workout” takes place back in the early days of NJ’s alliance with, well, the Unrivaled Alliance. Also featured in this incredible volume is a massive gallery of Jacob Mott’s artwork. The gallery also includes beautiful 3D renderings of the Incredibly Hung Naked Justice himself, by none other than the immensely talented Albron. For more previews and story details check out Naked Justice Beginning #1, Naked Justice Beginning #2 and Naked Justice Beginning #3!